The first sight of Ayot St Lawrence church across the fields from the village is likely to cause the visitor to stop in their tracks. It's like catching a sudden glimpse of a chunk of the Parthenon frieze sitting between the wickets on a village cricket pitch. It's coolly beautiful, and quite, quite unexpected. In Tom Gentleman's 1937 poster, one of the famous series advertising Shell petrol and oil, it's described as 'a strange church', and it's hard to disagree with that. The church of Ayot St Lawrence, built 1778-9, was revolutionary in its day. Churches in England had been designed using classical elements since Inigo Jones' St Paul's, Covent Garden (1631-3), not least Wren's 50 or so London City churches, but they relied chiefly on Roman models (ancient and modern). 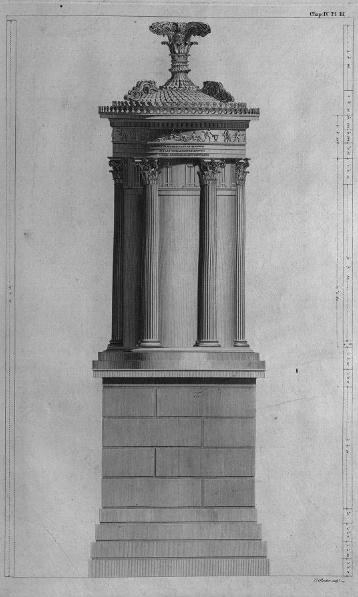 Palladianism was very fashionable in 18th century England, but this too was chiefly inspired by classical Roman architecture. Ayot St Lawrence was the first church - almost the first building of any sort - in England to go back to the Greeks for inspiration. The church was designed by Nicholas Revett (1721-1804); it was one of only four complete buildings he was responsible for. (3) Being a gentleman of private means, he didn't need to work for a living. Together with James 'Athenian' Stuart (1713-88) and others he spent several years in Athens, the Greek islands and Ionia (part of Turkey), studying the remains of ancient Greek architecture, under the aegis of the Society of Diletantti, an institution founded in 1734 to promote the study of classical art. 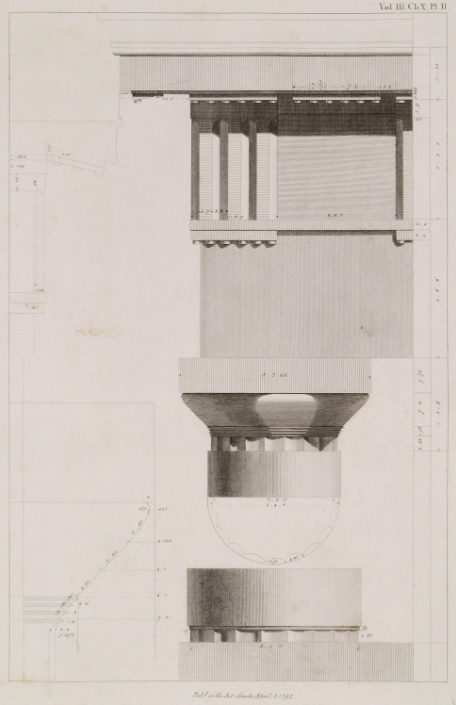 Four volumes of detailed drawings were eventually published, from 1762-1816, which were immensely influential. 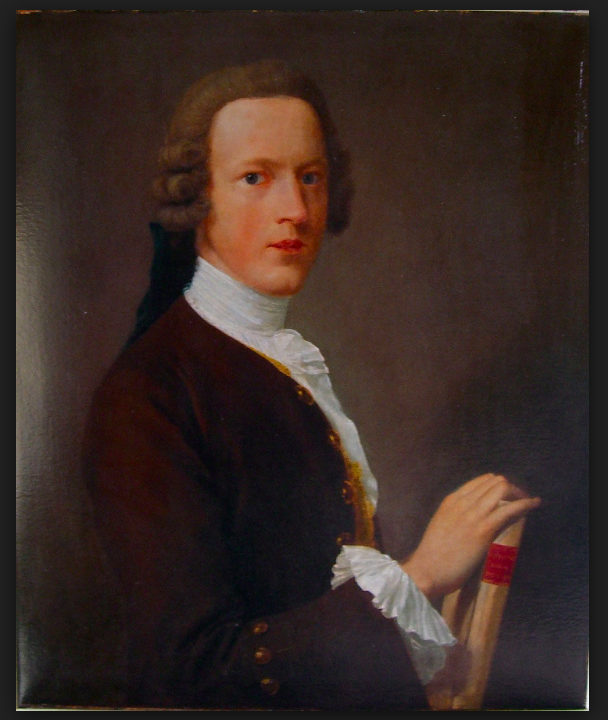 In the 1770s the inhabitants of Ayot House were Sir Lionel Lyde and his wife (also his cousin) Rachel. He had made his fortune by importing tobacco, grown by means of slave labour, from the West Indies and Virginia, and decided that he wanted to spend some of his ill-gotten wealth by building a new parish church which would serve the triple purpose of place of worship, mausoleum and eyecatcher when seen from his house. (There was already a medieval church near the house; see the appendix below.) Why he chose Revett doesn't seem to have been recorded; maybe he was an admirer of his and Stuart's The Antiquities of Athens and Other Monuments of Greece, or perhaps he had a connection with the Diletanttis. The inscriptions to Sir Lionel and Rachel (on the west of the pedestals) are all but illegible, but on the east of the south monument is a relatively well preserved inscription recording Revett's achievements (and Lyde's bankrolling of the church). Nevertheless, the overall impression of the west front is mightily impressive. The detailing of the portico is especially fine. I don't know if the deep blue of the west door is original, but I think it's just right (and matches the tiles around the external font). Originally only the Lydes and their social equals would have used this door, while lower ranks would have had to make do with a small, purely utilitarian door on the south (now internal). Although the details of the west front are derived from Greek sources, the overall conception isn't. As Pevsner points out, 'the whole composition with side colonnades and little outer aedicules [the two pavilions] is not at all Grecian. It is a purely Palladian composition, that is the type of composition which was customary for English country houses right through the 18th century. To have churches really copying Greek temples another fifty years had to go by.' The church is often spoken of as being Palladian, including on the village's website (even though the text admits that this is to some extent a misnomer), which just goes to show that categorisation is fraught with difficulties, and often not very useful. I particularly like the east end, which consists of a tall apse (a semi-circular adjunct to a building) enclosed by a lower one, only this latter apse has the middle third sliced out of it. There are two strainer arches on the sides of the main apse. All this creates complex and intriguing geometries, which change as you walk round. Altogether it looks like a building designed with some industrial process in mind - a blast furnace or a pottery kiln, perhaps. Notice that the apses are built almost entirely with headers - that is, bricks placed with their short sides exposed. This is because it's easier to build curved walls in header bond. We began in contemporary rural Hertfordshire, were transported to classical Greece, then caught a glimpse of distant dark satanic mills. (7) Once we’re through the west (and only) door, we’re back in Greece. Only at first sight, however, for as in the west front the overall design of the body of the church isn't Greek at all, and neither are some of the details. 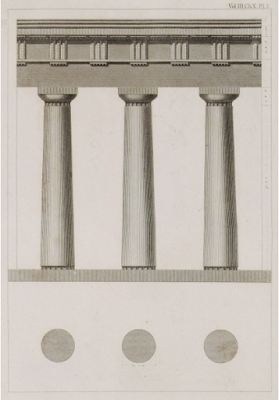 Greek temples are, in plan, simple rectangles. The interior of Ayot St Lawrence is a rectangle with short extensions on all four sides, in other words it's basically a Greek cross, (though rectangular rather than square). (Greek cross is an ironic name, in this context; here the 'Greek' refers not to the classical era but to the later, Christian, period.) Byzantine churches are typically Greek crosses, and post-Renaissance architects often adopted this shape. 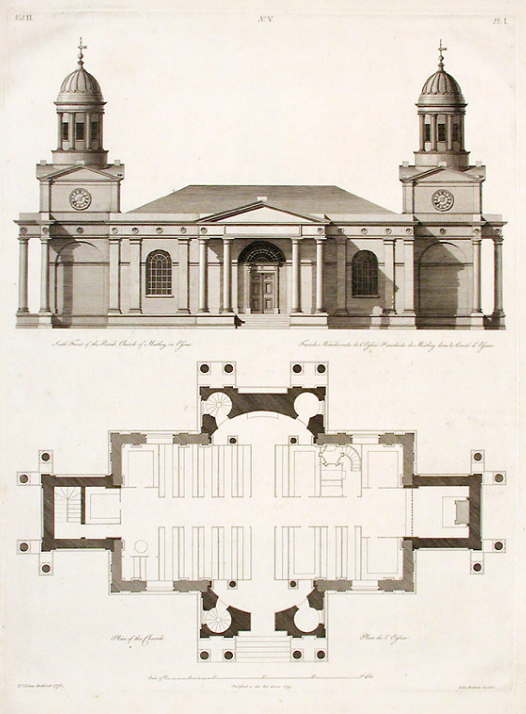 For example, one of Wren's early (1672) designs for the rebuilding of St Paul's after the Great Fire was a Greek cross in plan, as is James Paine's Gibside Chapel, County Durham, begun 1760. You can call the interior Greek, Palladian, Byzantine, classical, neo-classical, or what you will - who cares when it's this good? Entry is into a kind of narthex, with store rooms on either side, one of which must contain a staircase leading up to the west gallery. The gallery is supported by two Ionic columns, which adds drama as your first view of the interior is through this screen. Stepping through it the space is revealed. There are short transepts north and south, and in the east a shallow, semidomed apse, with what looks at first as if it's going to be an ambulatory (a passage behind the altar). However, if you've walked around the outside first you'll remember that this can't be the case. The north transept contains the pulpit, like a lecturer's podium, the south the organ and clerk's desk, all of which are I think original. The pulpit still has its candleholders, which look as if they're still used for their original purpose. The moulding of the west gallery is continued all round the church, and is supported by pilasters with egg and dart capitals. Above this, that is well above eye height, are the windows, of clear glass, offering views of sky and clouds. The stately coffered ceiling presides imperiously over everything. There are a few monuments, of no great aesthetic significance, but I'll pick out one that's of some interest. It commemorates Major Eustace Crawley, who died in the fourth month of the First World War; it's by (his brother? his father?) Geo. A. Crawley, and is in baroque style. This makes it unusual for its date; 20th century monuments, except simple lettered tablets, aren't at all common, and when they do occur they're generally in what might be called minimal classical style. The Crawley monument is sufficiently convincingly baroque from a distance to make you think that it's been imported from the earlier church. However, a standard feature of such monuments is symbols of mortality - hourglasses, skulls and the like. This monument has none. It seems strange that just as the century was about to embark on industrial-scale killing artists should come over all squeamish about death. Revett made use of his study of Greek buildings, basing several features of his church on ancient models (though not precisely copying them). 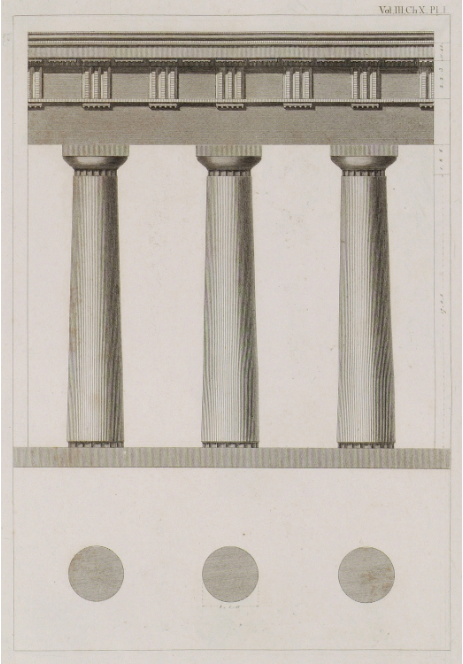 The Doric Order of the Temple of Apollo, Delos, from Stuart and Revett's The Antiquities of Athens, vol III, 1794. 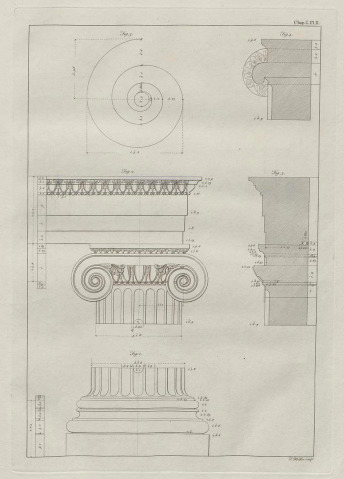 The Doric columns of the portico are based on those of the Temple of Apollo, Delos (426 BCE), including the (to me peculiar) device of having them fluted only for the top and bottom few inches. However, Revett's columns are slimmer and more graceful than the originals. Detail of the Temple of Apollo, ibid. On the front of the portico beneath each triglyph (the tablets with two vertical grooves, forming three vertical projections, as seen in the top middle of the above photo) are six small guttae (decorative stone 'pegs', just about visible on the middle far right), as in the Temple of Apollo and other Doric buildings. However, on the sides of the portico these become simply one long strip (as seen in the centre of the photo). Whether this was a deliberate variation of Revett's, or a result of cost cutting or a lazy builder, I don't know. The northern screen colonnade from the east, with a glimpse of the house. The Ionic columns supporting the gallery are based on those of the Temple of Bacchus, Teos, near Smyrna. However, as Friedman points out, many of the details of the interior are derived from Roman rather than Greek models. In particular, the hexagonal and octagonal coffering of the ceilings (except the main, nave, ceiling) is taken from the Temple of Peace in Rome, and the centrepiece of the nave ceiling is from the Temple of the Sun in Palmyra. What's more, 'The Ionic column screen separating vestibule and sanctuary, and the continuous range of single and double Tuscan pilasters round the lower part of the walls probably rely on Palladio's reconstruction of Roman baths.' The building is far more of a hybrid than it first appears when seen across the fields. Apart from being not so pristinely white as it was when first built, and having acquired some new furniture and a few monuments, the church is much as it was in 1778. However, there's one major exception to this. 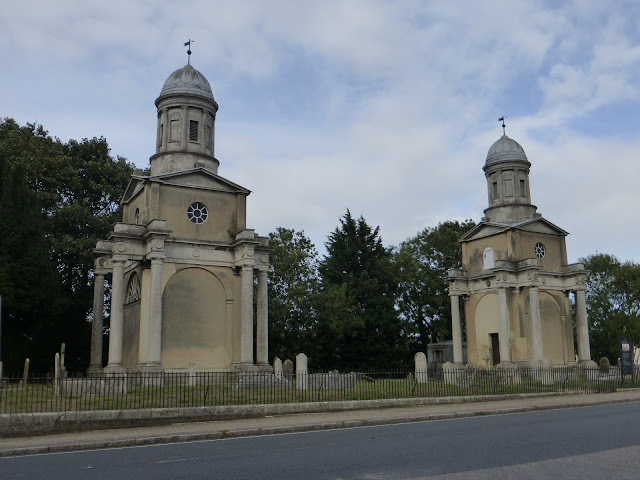 This seems a good moment to mention Mistley Towers, all that's left of Mistley church, Essex, which has, or had, several similarities to, as well as some significant differences from, Ayot St Lawrence. In 1776, two years before work started on Ayot Lawrence, Robert Adam was commissioned to augment an existing plainly rectangular church of 1735, partly to attract visitors to the town and partly as an eyecatcher. He added Tuscan porticoes north and south, and towers topped with domed, smaller round towers, very like those on Revett's tempietti, east and west. Adam's work is Roman in inspiration, not Greek, but nevertheless the whole composition is reminiscent of Revett's church. The church, except for the towers, was demolished in 1870, and the two towers now stand at an awkward distance from each other, like siblings who've had a terrible row but can't quite bear to storm off. Ayot St Lawrence was the first or second Hertfordshire church I visited, in 1982, and I've been back many times; I've always found it open. As I said at the start, it's unique in the county, and it's hard to think of many churches similar to it in the whole country. It may be strange, but if so it's wonderfully strange. Almost every description of the two churches, old and new, includes the story (Pevsner keeps his head and calls it a 'tradition') about how the old church came to be a ruin. The story goes something like this: Sir Lionel wanted a new church to be built which would serve as an eyecatcher from his house, which would mean that the old church would no longer be required. So, while the new church was being built, the demolition of the old church was begun. However, the bishop got to hear of this before the demolition was complete and ordered that it be halted. It was, but too late, and the old church was never repaired and remains a ruin today. These two narratives don't agree. The second one conforms more or less to the standard narrative as related today, though it implies that Lyde's main motive in demolishing the church was a land grab. The first states that the church was already in a poor state of preservation and implies that no demolition took place, time and indifference having already reduced the church to a semi-ruin. This is entirely plausible; many churches were badly neglected during the 17th and 18th centuries, which is why so many of them had to be rebuilt in the 19th. Which account is closer to the truth? We can't know, but I'm inclined to accept the magazine's version - after all, it is the word of a gentleman. The ruin was consolidated in the 1920s, and again in 1999. The tower and some of the walls stand scenically to their full height, and are open to the public. We can be grateful to Bishop Thurlow for thwarting Lyde's plans. (1) The others were Markyate (1734), and Totteridge (1790). Totteridge has been part of Barnet, Greater London, since 1965. It would take a mighty effort of will to describe its church as 'neo-classical', however. For Markyate, see (2) below. (2) This statement requires some clarification and qualification. Parts of some churches in the county were built or rebuilt during this period; for example, the chancel of Offley was remodelled in c.1777 and the west tower built in 1800, but the nave essentially dates from c.1230. Markyate's nave was built in 1734, but the aisles were added in 1811, and the tower is of indeterminate date (though clearly post-medieval and pre-Victorian). Its chancel, like that of Totteridge, was completely rebuilt in the later 19th century; we must assume that the original chancels were Georgian (rather than medieval survivals from earlier buildings). Rickmansworth seems to have been built in 1630, though only the tower now survives, but it's not certain (as far as I know) if a complete church was built at that date, as it was rebuilt in 1826 and again in 1890, destroying the earlier structures. Nettleden was built at the early date of 1811, except for the late medieval tower. So few churches were built between the reigns of Henry VIII and Victoria because there were already sufficient medieval churches to serve most of the needs of the parishioners. It wasn't until Hertfordshire's population started to grow rapidly in the 19th century (it roughly doubled in this period), and with the encouragement of the Victorian religious revival, that church building started to intensify. (3) The others are the Music Temple, West Wycombe, Bucks (1770s), Mere House, Mereworth, Kent (1780), and the Temple of Flora, also West Wycombe, which has been demolished. 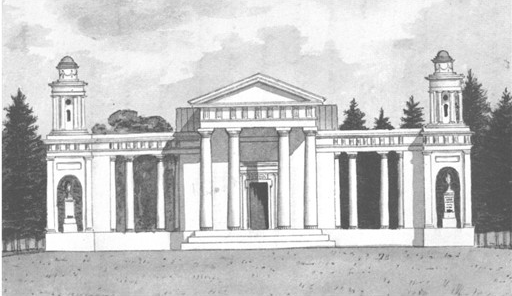 He also designed additions to a few other buildings, for example the Ionic portico of West Wycombe Park in 1771. 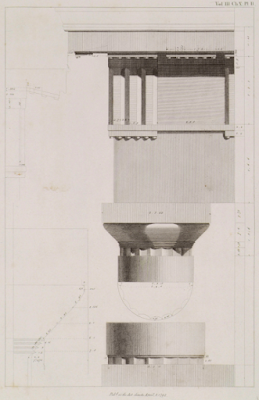 This was based on the Temple of Dionysus, Teos, Turkey, which Revett had measured in 1764-6. 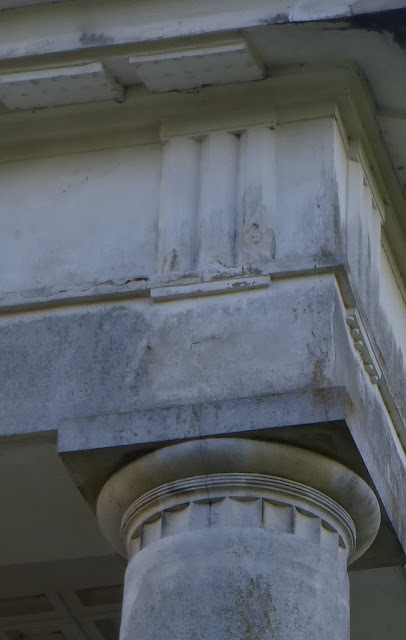 This could be said to be the true beginning of Greek Revival architecture in England. (4) Pine cones feature in Greek art as emblems of Zeus, Artemis and Dionysus. Despite trawling though my library of church books, I can't find anything definitive about any particular Christian significance they may have. Perhaps Lyde, or whoever commissioned and paid for the monuments, was concerned only with their decorative, rather than symbolic, effect. Or do the urns contain stylised flames, a common symbol of eternal life, or, just possibly, pineapples? (5) For example, C. P. Canfield's website English Church Architecture, which I admire very much and refer to frequently, finds 'no mitigating features of interest' in the plain brick of the church. (6) 1779, the year the church was finished, also saw the start of construction of the world's first major iron bridge, at Ironbridge, Shropshire, perhaps the most iconic structure of the Industrial Revolution. Maybe I should point out that although it's broadly true that Britain was at this time becoming the world's dominant country, it's also the case that it was in the process of losing the American Revolutionary War. (8) The Georgian Parish Church: 'Monuments to Posterity', Spire Books, Reading, 2004. 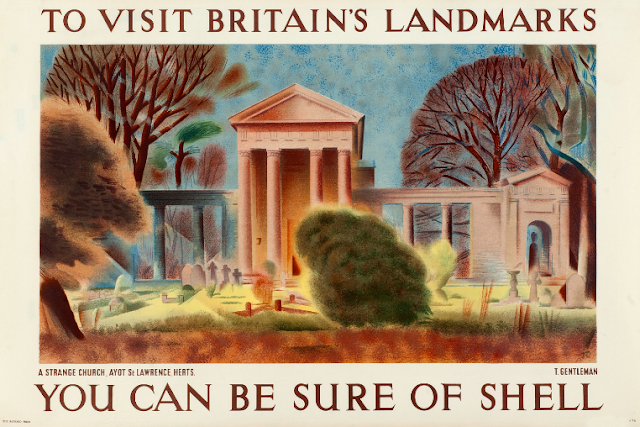 I'm indebted to Friedman not only for details of Revett's Grecian borrowings but also for pointing out the references to Ayot St Lawrence in the Gentleman's Magazine.